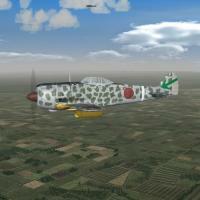 Just a reskin for Geo's Ki-44 "Tojo", representing 4 Chutai, 64 Sentai in Burma/Indochina in WW2. From a 'partial' redrawn template, the skin maps remain in bmp format. There are no individual aircraft markings, just the Chutai designator. As always, fairly easy to follow, yet detailed install instructions are included. So, please read them.